Transparency Market Research has published a new report that discusses the global nebulizers market. The report, titled “Nebulizers Market - Global Industry Analysis, Size, Share, Growth, Trends and Forecast, 2013 - 2019”, is available for sale on the company’s website. The research analysts have compiled a holistic report using SWOT analysis and Porter’s five forces analysis. The report sheds light on the drivers, restraints, threats and opportunities that this market faces.According to this market research report, the global nebulizers market was valued at US$610 mn in 2012 and is expected to reach a figure of US$937.7 mn by 2019, growing at a CAGR of 6.50% from 2013 to 2019. The global nebulizers market is segmented on the basis of product type and geography. 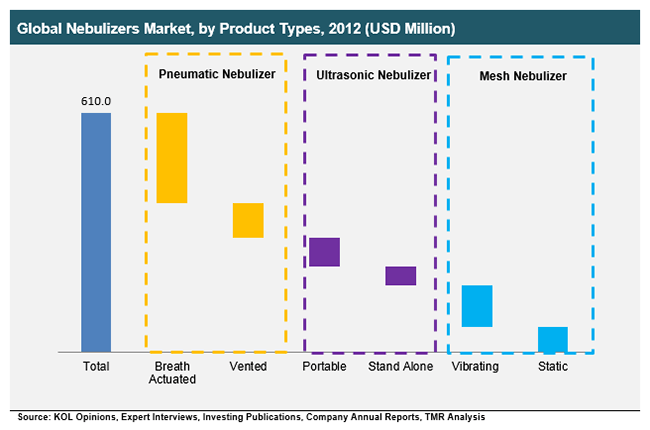 The product segments of the nebulizers market are pneumatic nebulizers, ultrasonic nebulizers, and mesh nebulizers. Pneumatic nebulizers are further sub-segmented into breath-actuated pneumatic nebulizers and vented pneumatic nebulizers. On the other hand, ultrasonic nebulizers are sub-segmented into standalone ultrasonic nebulizers and portable ultrasonic nebulizers. Furthermore, the mesh nebulizers segment is divided into static mesh nebulizers and vibrating mesh nebulizers. Geographically, the global nebulizers market is segmented into Asia Pacific, Europe, North America, and Rest of the World. According to the research report on the global nebulizers market, North America led the market in 2012 due to the increasing number of asthma and COPD cases. Analysts predict that in the coming years, this region will continue to lead the market, as respiratory diseases remain on the rise. This regional segment is closely followed by Europe, as the region has a huge pool of geriatric population. Going forth, the global nebulizers market is likely to see Asia Pacific emerge as the leader due to several reasons. One of the noteworthy factors impacting the growth of the market in this region is the growing number of cases of bronchitis and asthma. Rising pollution levels, especially in China, are the main reason why Asia Pacific is gaining in the global nebulizers market. Furthermore, the trend of large medical device manufacturers looking to expand in the developing economies in Southeast Asia is also going to help the Asia Pacific’s revenue in the forecast period. The research report has highlighted the competitive landscape of the global nebulizers market by profiling some of the key players such as PARI Respiratory Equipment, Inc., Allied Healthcare Products, Agilent Technologies, Inc., Omron Healthcare Co., Ltd, CareFusion Corporation, GF Health Products, Inc., Covidien plc, GE Healthcare Ltd., and Philips Healthcare. The chapter on company profiles includes a detailed explanation about the company overview, investment details, growth projections, business and marketing strategies, and research and development status. The global nebulizers market will mainly be propelled by government initiatives to curb respiratory diseases that are on the rise as pollution levels are breaking all barriers.